Jay Ingram | TV, eh? 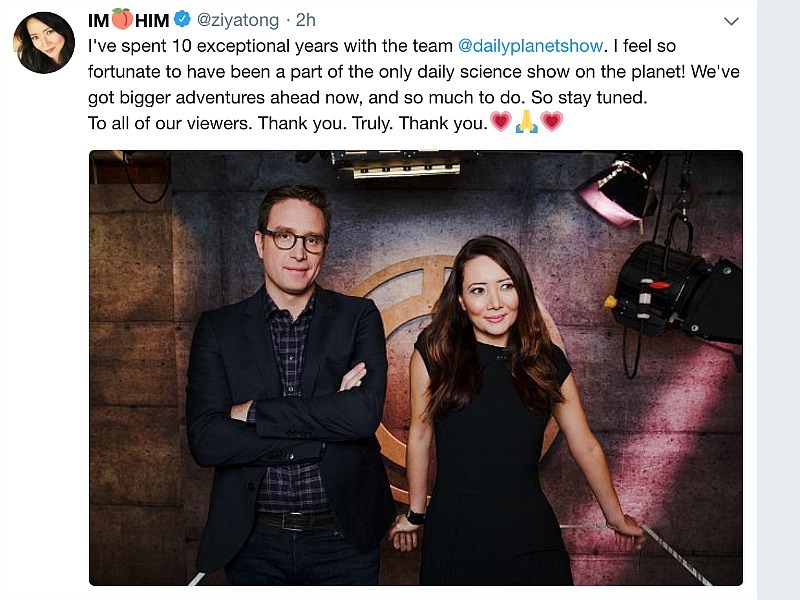 It’s the end of the road for Daily Planet. No more “High-Tech Toys Week,” no more “Shark Week,” no more daily science updates from hosts Ziya Tong and Dan Riskin. Bell Media announced is has chosen not to renew the long-running Discovery series after 23 seasons. “This programming change reflects the significant financial pressures Bell Media faces in a broadcasting industry defined by growing international competition, evolving viewing options, and an uncertain regulatory framework,” read a statement sent from Bell Media on Wednesday. Debuting as @discovery.ca in 1995 with host Jay Ingram, the program was renamed Daily Planet in 2002. Ingram exited Daily Planet in 2011 after 16 years at the helm. Past hosts have included Judy Haladay, Gill Deacon, Natasha Stillwell and Valerie Pringle. The program captured a Canadian Screen Award in 2017 for Best News for Information Series.